In the United States, fanciers obtained the first Shih-Tzus in the late 1930s. The origin of the Shih-Tzu is obscure. The Shih-Tzu originated in Tibet, where it was kept in temples as a sacred dog. It is known that they were occasionally given to the Emperors of China during the Manchu dynasty (17th century) as a tribute of great honor and that is how they came to be established in China. In that country, the dogs became little temple dogs and were kept in the palace and carefully guarded and cared for by the court eunuchs. When the Peking Kennel Club was formed in 1934 there was much confusion as to the difference between certain small breeds. In 1938 an individual standard was set for the Shih-Tzu and it was recognized as a separate breed from certain other Tibetan breeds. With the war and the takeover of Peking in 1949 there were no more exported from China. In 1952 there was a strong fear that the breed was developing poor structure and it was decided to cross a Pekingese into the line in England. The purpose was to obtain a less leggy dog with a better coat and shorter muzzle. This was accomplished, however the bowed front legs of the Pekingese are something that still can be seen on some Shih-Tzu today. There was also a faction in England called the Manchu Club that believed a smaller dog better represented the ture heritage of the temple dogs. The Kennel Club recognized this in their 1938 standard by stating the ideal weight was between 9 to 16 pounds which is what the current standard recognizes. In the United States, fanciers obtained the first Shih-Tzus in the late 1930s. The breed gained in popularity in 1960, with many imports coming from England and Europe. The breed was shown in the Miscellaneous class at AKC dog shows. It was not until 1969 that the Shih-Tzu were permitted to be shown as a separate breed in the Toy Group. In 1969, 2,811 Shih-Tzus were registered which increased to 14,894 in 1978. Within that nine year period over 85,000 Shih-Tzu were registered with the American Kennel Club, placing the Shih-Tzu in the top 25 most popular breeds according to the AKC. It is no surprise that the temple dog had come into the homes of many owners — this is due not only their Imperial background but also to their personality. One of the strongest characteristics of the Shih-Tzu is its personality. The Shih-Tzu is a friendly, nonaggressive dog that is a good companion for children and other breeds of dogs. Shih-Tzus are known for their fun-loving play, romping around the apartment or in the country side. The Shih-Tzu is a people-oriented dog, they cherish no more than the love of people. They will sit patiently, remaining still with their eyes gazing intently on your face waiting for you to call them over to be patted. The Shih-Tzu is not a one-person dog. Shih-Tzus are happy to entertain any stranger, once accepted by the family. This is one reason that they are becoming popular. They make friends where ever they go. The Shih-Tzu has a lap dog personality. It is not high-strung nor demanding. The pet Shih-Tzu is content during the day to lie in a corner with his legs stretched out behind him, snoring softly. If he has a choice he would prefer to be curled up in your lap. Don’t Miss: 4 Common House-Training Problems — And How to Fix Them! The coat is one of the characteristics that exemplifies the truly regal nature of the Shih-Tzu. The size of the Shih-Tzu is between 9 and 16 pounds. The appropriate weight is a matter of personal preference, with the breed standard allowing a wide range. They are sturdy dogs. In the city these little dogs become easily accustomed to noises and apartment living. The coat is one of the characteristics that exemplifies the truly regal nature of the Shih-Tzu. As with the size, the coat comes in a wide range of colors: from total black, to black & white, gray & white, red & white or pure gold. A white blaze on the forehead and a white tip on the tail are highly prized. The coat is not straight as in a Yorkshire Terrier, a slight wave is normal with a curl not appropriate. The coat has an under layer and when the dog is full grown this undercoat helps give an overall graceful appearance to the coat as it falls naturally to the ground. The coat, however, does require care and attention. Daily grooming is necessary; otherwise the coat can become matted and tangled, which will require cutting the coat. As a puppy little work is needed except to get the dog used to lying still on a table or your lap for a couple of minutes to get brushed. If one cuts the coat down, this takes away the elegant aspects of the breed. A kidney disease known as renal dysplasia is common in the Shih-Tzu breed. It bears some similarity to kidney disease in the Lhasa Apso. Whether the disease is inherited is not yet known but a good deal of evidence points in that direction. 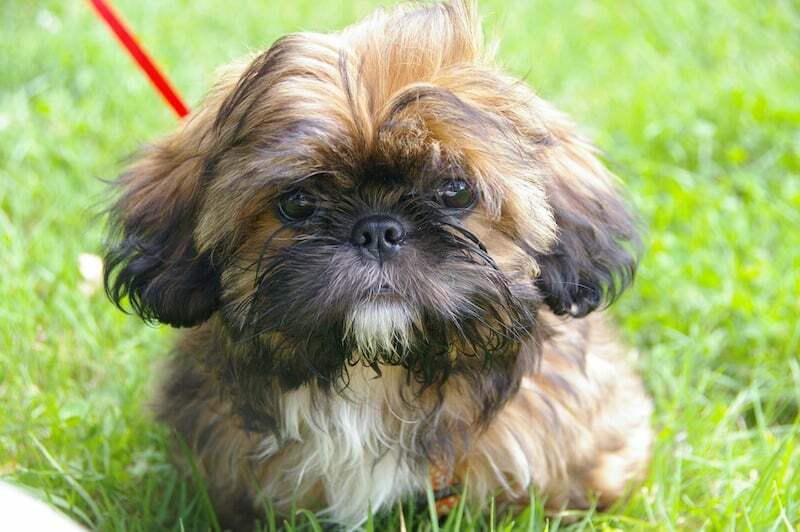 The occurrence of renal disease in young Shih-Tzu puppies and the fact that usually more than one puppy in a litter and in some instances, the entire litter is affected leads us to suspect it is inherited and that every effort should be made by Shih-Tzu breeders to avoid breeding any stock whose former offspring have been affected. Currently the disease is irreversible and death is inevitable. There are 3 stages of development. Unfortunately there are no clinical symptoms of early renal disease, which may progress over a period of months or years to the second stage,when symptoms first become obvious. The affected dog will develop an excessive thirst and will pass greatly increased amounts of urine. The urine will appear to be very diluted or watery. Some dogs will be listless, poor eaters, and may suffer a weight loss. In the final stage, the symptoms of stage two are more pronounced and may be accompanied by severe depression, diarrhea, vomiting and dehydration — all evidences of kidney dysfunction which will sooner or later result in coma and death. Renal disease runs high in all breeds of dogs. After the age of eight years, 85% of all dogs have some kidney degeneration or will have developed chronic nephritis. This is known to be a congenital, hereditary progressive kidney disease in certain breeds, whereby the kidneys do not maintain sufficient function to sustain life. Stones occur more in males than females because of the male anatomy: the urethra in the male is small and can easily become obstructed by a stone. The urethra in the female is larger and less prone to stone development. Phosphate stones are the most common and greater incidence of this type is found in the female than in the male. They are associated with alkaline urine and frequently with a bladder infection. Urate stones, composed of uric acid, are more frequently found in the urinary system of males and in these cases the urine is acid. Cystine uroliths, composed of the amino acid cystine, makes about 5% of all stones and occur exclusively in males. It is an inherited defect wherein cystine is reabsorbed into the kidneys rather than excreted in the urine and it accumulates in the bladder where stones form. They must be removed by surgery. A kidney disease known as renal dysplasia is common in the Shih-Tzu breed. Other characteristics are more cosmetic such as eye color; but taken together they set this breed apart from all others. The Standard describes an ideal representative of the breed. No individual dog is perfect, but the Standard provides an ideal for the breeder to strive toward. Breeders should be willing to let you see not only the quarters in which the puppies are housed, but all puppies, whether for sale or not. Be wary of the breeder who takes you into an anteroom and brings out one puppy for you to see. If a breeder is honest, he or she has nothing to hide and it is only by comparison that a buyer can judge the quality of a prospective pet. Watch the puppies play: Do their eyes sparkle? Are their coats clean? Their ears should be free of wax and inflammation. Their teeth should be white, their gums firm and pink. Evaluate the breeder too; you have every right to ask questions. It won’t take long to distinguish between the true breeder and one interested only in making a sale. The breeder should be able to answer questions about the origin and history of the Shih-Tzu, and general care of the breed. The responsible breeder will urge you to have the puppy throughly examined by a vet of your choice within 48 hours after the sale. The breeder should to willing to take the puppy back, if need be. Also, the breeder should show you how to groom the Shih-Tzu. There is a great selection of shampoo, conditioners and grooming equipment available. A small bath towel placed in bottom of sink prevents water from accumulating and gives puppy secure footing. Holding the puppy securely under its chest with one hand, soak its body with lukewarm running water, shampoo the body and rinse well. Leave the head for last. Carefully wet the head with a wet sponge and clean the hair with a no-tear baby shampoo. Still holding puppy securely, rinse thoroughly, being careful not to get water in its nose. A few minutes of cuddling in a towel reassures the puppy and soaks up excess water. Use a small hand dryer, low heat is normally all that is necessary. if puppy shivers, it is usually due to nerves rather than from being cold. Avoid blowing the warm air directly into the puppy’s face. Use a toothbrush to clean the whiskers and ears — ears on drop-ears need special attention. Ears should be cleaned with a cotton swab dipped in mineral oil or panolog. To avoid accidental injury to the eardrums, fluff the cotton out from around the end of the swab with fingertips. Wipe the ear clean and dry with another swab, being careful not to probe too deeply into the ear. A Shih-Tzu’s eyes are large and vulnerable and prone to ulceration. Special attention should be given to them daily. Living close to the ground, it is easy for dust or dirt or a stray hair to get into the eye and cause irritation. Use human eye wash daily, such as collyrium. This is a gentle eye wash — remove any matter from eye corners. A flea comb may be used to remove any dried food in the beard or mustache.